dig trenches for drainage 排水用の堀を掘る. He fought in the trenches. 彼は塹壕の中で戦った. Workmen were digging a trench beside the road. 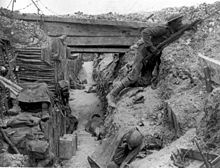 A British trench during World War I. Borrowed from Old French trenche. A long, narrow ditch or hole dug in the ground. (military) A narrow excavation as used in warfare, as a cover for besieging or emplaced forces. (archaeology) A pit, usually rectangular with smooth walls and floor, excavated during an archaeological investigation. I was the first person in my high school to wear a trench and fedora constantly, and Ben was one of the first to wear a black trench. A classic trench can work in any kind of weather and goes well with almost anything. (usually followed by upon) To invade, especially with regard to the rights or the exclusive authority of another; to encroach. Shee is the Judge, Thou Executioner, Or if thou needs would'st trench upon her power, Thou mightst have yet enjoy'd thy crueltie, With some more thrift, and more varietie. He could make what laws he pleased, as long as those laws did not trench upon property rights. [O]ur ideas, therefore, must trench upon the province of tactics. (military, infantry) To excavate an elongated pit for protection of soldiers and or equipment, usually perpendicular to the line of sight toward the enemy. (archaeology) To excavate an elongated and often narrow pit. To have direction; to aim or tend. To cut; to form or shape by cutting; to make by incision, hewing, etc. The wide wound that the boar had trenched / In his soft flank. This weak impress of love is as a figure / Trenched in ice, which with an hour's heat / Dissolves to water, and doth lose its form. To cut furrows or ditches in. To dig or cultivate very deeply, usually by digging parallel contiguous trenches in succession, filling each from the next.